October is Breast Cancer Awareness month! Lovable Labels has come out with "Think Pink" labels for moms, women, and young girls just for this. Check out the review here. Want to buy it? 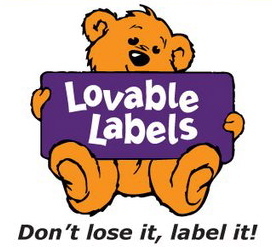 Lovable Labels has a wide variety of labels, not just for Breast Cancer Awareness month. The Think Pink labels pack sells for $19.95. Remember, 0.50 from each pack gets donated towards a good cause! Win It: 1 Whirlwind of Surprises' reader will win a 1 pack of Think Pink Lovable Labels for themselves. Open to US/Canada. Good luck! I'm making use of Rafflecopter, a new beta software, for this giveaway so please enter on the Rafflecopter form below. If you encounter any problems or have any comments about this new method of entry, please leave a comment below. If the form will not let you add your daily tweet, please fill out mandatory entry again with DO NOT COUNT in the extra info box. It will then let you complete the daily tweet. Give it a minute to load and if you don't see the widget after that, please hit refresh. Disclaimer: The product/s mentioned above have been sponsored by Lovable Labels for the purposes of this review. No other form of compensation was received. Opinions expressed belong to Whirlwind of Surprises and are NOT influenced in any way. Please view my full disclosure. I would use these to label my dishes at pitch-ins! My daughter and I will both use the labels. Thanks!